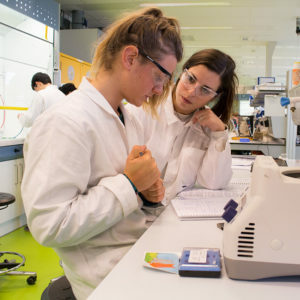 As an additional activity after the online course ‘Teaching in University Science Laboratories (Developing Best Practice)’ is finished, on 6 February 2019, from 13.00-14.00 (CET, Brussels time) a webinar about the use of computers to support the teaching and learning process in laboratory classes will be organised. Sjors Verstege who is doing his PhD research in this field will share his results obtained at the Wageningen University & Research in the Netherlands. Please find here below a short abstract of his talk. As an introduction to this webinar we will give a short (5 minutes) retrospect of the online course Teaching in University Science Laboratories (Developing Best Practice) and give you some information about the future plans. regarded as a vital component of a chemistry curriculum. Teachers have several goals for laboratory classes, including hands-on research experience, group work, broader communication skills, data collection and (error) analysis, planning, and laboratory report writing. However, many of these goals have been argued to be better accomplished outside the cognitively demanding learning environment of the laboratory. Careful preparation for laboratory classes, such as practicing with the chemical concepts and data analysis skills, has proven to increase the quality of knowledge construction during laboratory classes. Virtual and simulated laboratories are valuable assets to prepare students for laboratory classes, and are also a convenient and effective replacement of laboratory classes, especially in contexts where the laboratory is not an option such as distance education. Sjors Verstege is a 3rd year PhD candidate at Wageningen University, working at the laboratory of food chemistry. Before starting his PhD, Sjors obtained a BSc and MSc in Food Technology, with a minor in education. Sjors has 4 years of experience in educational development. His current project has 2 foci: The first is to design, implement, and evaluate virtual experiment environments (VEEs) that are used in undergraduate food chemistry education. The second is to analyse student behaviour in VEEs, and relating this to students’ learning outcomes and self-regulation.